This tutorial will show how to configure EasyIoT Cloud automation module. 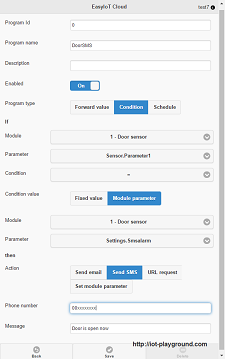 As a result of automation program SMS will be send if door/window sensor is activated in specific time period. In this tutorial we will show how to build WiFi light sensor. We will use ESP8266 and LDR (light dependent resistor) and connect to EasyIoT Cloud. Sensor is plug and play. ESP8266 Arduino IDE will be used to upload program to ESP8266. 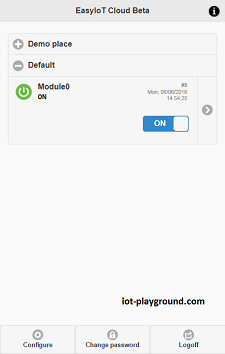 In this tutorial we will show how to build WiFi internet controlled switch connected to EasyIoT Cloud. 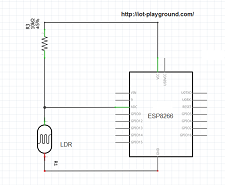 This tutorial is improved version of ESP8266 internet connected switch. We will use ESP8266, solid state relay and Arduino IDE. AP can be configured in WEB interface.